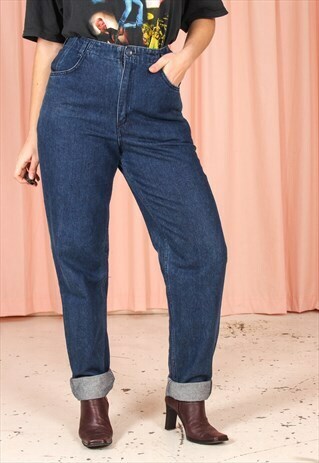 This pair of vintage mom jeans come in a dark wash with high waisted fit with a zip fastening to the front. CONDITION: Excellent Vintage Condition SIZING: Will fit UK size 16 depending on desired fit. Our model is a size 10 and 5'6. Refunds are accepted for any reason within 14 days of purchase. We add new items every day so don't forget to follow us! WAIST -34" HIPS - 44" INISDE LEG - 35"